This lecture is dedicated to the comprehensive discussion of Embryological Origin of Heart. In section one of this lecture, the educator highlights the different Heart Fields. In the beginning, an elaborate discussion on Primary Heart Field and Secondary Heart Field takes place. Afterwards, the educator reports Patterning of Cells and sheds light on Cardiogenic Region. Section two is about Heart Tube. In this section, firstly Formation and Position of heart tube is discussed and then Pericardial Sinus is explained. 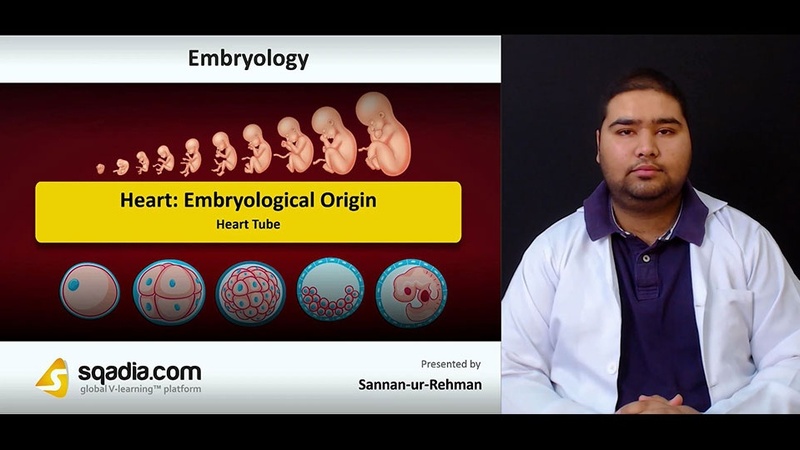 Moving forward, the educator covers the topic of Cardiac Jelly and thoroughly elaborates on the various layers of Heart Tube. In section three, the topic of Formation of Cardiac Loop is covered. The educator elucidates Elongation of Heart Tube at first. Later, the educator discusses Cardiac Looping and sheds light on the Clinical Correlates. Section four is about Molecular Regulation. The educator puts forward a detailed explanation of Heart Forming Region and comprehensively introduces Retinoic Acid. The process of Cardiac Septation is then brought under consideration after which Cardiac Looping is peculiarly explained. Apart from this, the educator focuses on Lengthening of Outflow Tract. In section five, the Development of Sinus Venosus is addressed. After giving an overview of Blood Flow, the educator discusses Left Sinus Horn and Right Sinus Horn. Subsequently, light is shed on Right Venous Valve.